Advice for intermediate writers – picking your best story. Beginning writers just need to get writing. True. Even years into the craft, the standard advice is to keep writing. Always. Absolutely. But here’s a hint for those of you have been at it for a little while and want to use your writing time as efficiently as possible. The skill of determining in which story to invest your time is an invaluable time-saver. It can take a year (or more) to write a novel. You don’t want to write something that has an audience of one (you) and cannot sell. I did this—for me it was a literary medieval fantasy tragedy. The tragedy was that there was no market for my conglomeration of genres and styles. And it didn’t help that it was boring. I had about a zillion ideas, and I chose that one. Good practice, yes. But not a good use of that year of my life. As a writer, you ought to have about one zillion ideas. Indeed, if you intend to make a career of it, you must. So why write the first thing that pops into your head? I’ll go you one further; why write the thing that pops into your head that you love the most? Sacrilege you say? You think you simply must, must, must write that story you absolutely love? Let me put it another way. I love all of my ideas. They’re like my children (you’ve heard this, right?). I submit that you are not a single story. You’re a writer of many stories. So why not write something you love (could be any of your children) that your potential (and as-of-yet unknown) audience will love the most? So many writers I meet are so determined to write that one story that they love that they’ll forgo all others, whether or not anyone else loves it. And, importantly, whether or not it can sell. Here’s my advice for avoiding spending a year of your life writing something you think is great, but no one else will. Try writing a “one-page” for 5-10 different stories. Then try them on people. Everyone will tell you that a single story idea is “good.” But it might be more valuable to have each of those people tell you which story is the best. This happened to me via contests. 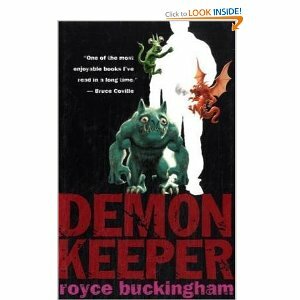 For thirteen years, I wrote stories for competitions, but DEMONKEEPER was the one that kept winning. Hmmm, I thought, maybe that’s the one I should work on for submission to publishers? I did. It sold. 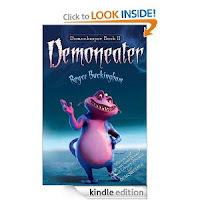 The rest is history (and two sequels—DEMONEATER and DEMONOCITY). The above advice is a tool, not a rule. But it’s a tool I wish I’d had before I invested a year in my unsellable novel and more than a decade in all of those other stories that did not win competitions. It was all good practice craft-wise, and I certainly had to practice for a number of years before anything was good enough to sell, but after I was a competent writer (say seven years in), I could have streamlined the getting published process a bit (by years) by testing my story ideas on as many people as possible at the outline/summary/synopsis stage before writing them all. Thanks Royce for your advice. Here's a description from Amazon of DEMONKEEPER, the first book in the series that Royce Buckingham is offering for a giveaway. Keeping demons isn’t a very social activity, and when Nat goes on a date with Sandy, a junior librarian’s assistant, it’s a disaster in more ways that one—while Nat’s out, a very scary demon called the Beast escapes. Can Nat get the Beast back to the house and make things right with Sandy—and do it all by himself? Seattle’s local Demonkeeper, Nathaniel Grimlock, is lost at sea. In his absence, the demons have taken over the city! It’s up to his delinquent apprentice Richie and Nat’s two competing girlfriends to prevent Seattle’s destruction until he can find his way home to face the most powerful demon of them all. Demonocity is the catastrophic conclusion to Royce Buckingham’s bestselling German series. 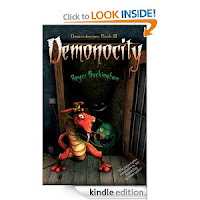 To enter the contest for DEMONKEEPER, all you need to do is be a follower (just click the follow button if you’re not a follower) and leave a comment by September 8th. I’ll announce the winner on September 10th. If your e-mail is not on Blogger, please list it in your comment. International entries are welcome. Great advice. Having the ideas definitely isn't a problem - choosing the right one is so important. Thanks for the tip! Tremendous advice! Every idea we have is good but perhaps not the right one. I totally agree that reaching out and asking others what grabs them can be a huge time saver when deciding what story to continue with. I'd love Demonkeeper. It looks exactly like the kind of book I can get into. Thanks Royce for the wonderful post and sharing your incredible writing journey with us. Good luck!. This was an absolutely fantastic post and something I've been thinking about all summer. So thank you for it! I think I definitely still fall into the beginner category and certainly my current WIP is not something I'm in "love" with , but I'm enjoying I guess along the way. I think I'm worried that yes, I have a lot of ideas, but not sure which one I ought to committ the time to when I start the next one. Particularly when I'm not a young gal anymore, I work full-time 10 hour days at a unenjoyable job, and I am so new to all this. But what you said about writing out an actual page and running it by about 5 people , sounds good! I don't even have friends to ask about that and I don't have CP's yet. I guess I've been waiting to have a full novel done, and fully revised before I'd even consider letting someone see it...so I"m not sure how comfortable I'd feel posting any ideas online in contests or sharing with others. Like I feel I need to "grow" more as a writer, but maybe I'll always feel that way. So much learn and so so little time in the course of day :( Rats. Congratulations on the novel. They sound fantastic. And I especially love the cover art on the 2nd and 3rd installments!! So glad you enjoyed the post. You might want to check out some of the resources to the right, like SCBWI, Absolute Write, etc. for places to connect with other writers when you're ready to find a critique group. Good luck! Wonderful advice, Royce. Thanks for sharing with us. This looks like another fun series I'll have to read! Having just returned from SCBWI-LA where everyone kept saying "write what you love" this tip really resonated with me. Of course you need to write what you love, but it is important that publishers, agents, and readers love it too! Great advice, Royce. Thanks. I really like the idea of asking readers to pick the best, especially if you have a too nice critique group. Demonkeeper sounds great. I like the idea of Demons (hope that does not make me evil). Thanks Royce for this great post. I really like the idea of hunting demons - but honestly, it was the covers on the three books that convinced me to enter. If I saw them at my bookstore, I would pick up the first in the series. I follow by email (nrlymrtl [at] gmail [dot] com) and by twitter (@nrlymrtl). What you say makes sense, Royce, but your advice is so-o hard to follow! The one page selection choice is a great idea because I'm not sure I can see the best tree in the forest of ideas. I follow at wbgreenley (at) gmail (dot) com. As a fellow published author of "Bakemono" http://liferattle.ca/publishing/bakemono.html a collection of short stories about things that go bump in the night, I appreciate your advice about writing all the time. Congratulations on your success! As part of a digital publishing team I also appreciate the work you have done on your blog and hope to connect with you soon regarding a hot launch we have coming up. Thank you for bringing this book to my Attention. It sounds something that my niece would enjoy! Oh wow, that's a good idea. I have a whole slew of ideas that I love, and it's never occurred to me to see if anybody else likes them. Sounds like a shortcut to avoid a lot of heartache. Thanks! Super Tip!! As always :) And super contest! Whether I am lucky enought to win or not - I'll be getting this book ASAP! Thanks.